I gathered some information about "alchemical symbolism" here and there in the forums and as it was really interesting it could be a point worth discussing. It is in the nature of the subject that conclusive comparisons are difficult. This could lead to wild speculation, but it does not have to. In my opinion, alchemical symbolism always requires some consideration in relation to the entire manuscript or section. An isolated consideration is of little use here. Quote: I've collected quite a few rainbows from alchemical texts, where they have symbolic meaning related to the color sequence of chemical transformations. So, what about the nymphs ? Do they stand for elements and / or temperatures or metall(oid)s ? Is there an allusion on this or any other folio ? - As I said, an example. I would like to keep the discussion open for other approaches. Perhaps they sum up a picture behind the picture. (01-04-2017, 12:06 PM)bi3mw Wrote: You are not allowed to view links. Register or Login to view. 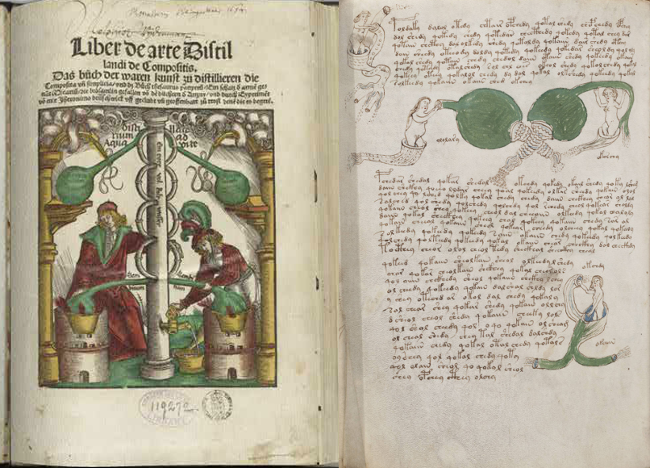 In my opinion, alchemical symbolism always requires some consideration in relation to the entire manuscript or section. An isolated consideration is of little use here. I think this is a good way of proceeding in all cases (i.e. not only when considering alchemical symbolism): taking single details in isolation is fun and can give place to much entertaining speculation, but the best hope to actually find something useful is considering "the big picture". While the whole ms is very possibly made of more or less independent sections, each single section should be explained as a whole. In her "Alchemical Traditions" essay in the recent You are not allowed to view links. Register or Login to view., Jennifer Rampling discusses alchemy in the specific context of the so-called biological/balneological section. She observes that the predominance of female figures is not compatible with known alchemical cycles, because a central concept of alchemy was the "conjunctio" (conjunction) of male and female and the male element represented gold, the ultimate objective of the alchemical process. She also writes that "the widespread use of personifications in both alchemy and other Western iconographical traditions supports the notion that the human figures in the Voynich Manuscript might also serve as allegories for other kinds of natural or occult knowledge". The example of personifications that Rampling mentions in a footnote is You are not allowed to view links. Register or Login to view. 's book about the Survival of the Pagan Gods: she is basically referring to the personifications of the planets. This is an immensely common theme in medieval art, but it's noticeably missing in the VMS: only the Sun and Moon appear as personifications (at least as human faces). The other planets seem not to appear in the VMS. Rampling also mentions a paper by Barbara Obrist that luckily is available online: You are not allowed to view links. Register or Login to view.. It's an excellent read. Among the many sources discussed, there is Wien, Österreichische Nationalbibliothek, ms. 2372. In 2003 You are not allowed to view links. Register or Login to view. observed that one of the works contained in this ms (Gratheus filius Philosophi) could suggest an alchemical angle in the labeled nymphs that appear around the zodiac medallions. Unfortunately I don't have access to the recent Facsimile. However, there is a basic question: What should the viewer see, an alchemical process with known symbolism or bathing nymphs? This is also what I meant with "consideration in relation to the entire manuscript ". It could be interesting to think about how a "colleague" could recognize the individual steps ( without "double heads" or males at all ). The predominance of female figures certainly offers sufficient possibilities. By the way, the production of gold was only one of many goals of practical alchemy. A less spectacular result could be desired here. (01-04-2017, 04:47 PM)bi3mw Wrote: You are not allowed to view links. Register or Login to view. What should the viewer see, an alchemical process with known symbolism or bathing nymphs? From what I understand, Rampling's view is that the balneological section cannot be traced to any known symbolism, but that it is likely allegorical. The bathing women are not meant to be literal bathing women, but symbols of something else. What this "something else" might be is of course an interesting subject. I am not aware of any specific theory interpreting the nymphs in the context of alchemy. I will see if I can find anything online. You are not allowed to view links. Register or Login to view. one can read a 1998 comment by You are not allowed to view links. Register or Login to view.. I think it could be useful to post it here in full. >alchemical content in the VMs. None of us, however, are experts. All I can say is that I have never seen an alchemical manuscript with the same imagery and pictures as are found in the Voynich. The plant drawings in the 'Herbal section' have many forerunners some going back centuries before the Voynich, as has been extensively documented. The drawings in the Astronomical section again seem to have many parallels in known manuscripts. The main 'alchemical' resonance is supposed to be the 'balneological' section, but here I find no parallels with alchemical manuscripts, except in a very general way. If this was an alchemical work one would expect to find some other alchemical manuscript with similar drawings - but I do not know of one. The drawings after all are not in code! I have an open mind on the subject, but have yet to see any real parallels. Perhaps one day I will find a manuscript that I recognize has common features with the Voynich - but not so far. My view is that we can only 'crack' the Voynich when we can put it into some context. The herbal section is probably the most amenable to this approach as there are many early herbals with similar structures . It really needs someone to make a study of the semiotics of herbals, and see if any of these features can be recognized as patterns in the Voynich text. Such things as repetitions of phrases, maybe things like "collect the fruits in the month of" or "this plant is for the lungs" . If the Voynich section is a herbal then it should share some of such phrases, and one might be able to find repetitive elements that give us a clue to the way in which Voynichese is structured and written. I don't think I could find any way at present to use alchemical manuscripts or ideas to throw light on the 'Balneological section . It may be that it will be someone with a background in semiotics rather than cryptography that will first read the Voynich MS . I don't think it will be a scholar of alchemy. (01-04-2017, 01:30 PM)MarcoP Wrote: You are not allowed to view links. Register or Login to view. The example of personification only the Sun and Moon appear as personifications (at least as human faces). The other planets seem not to appear in the VMS. The other five astrological planets are there, but (as per Curse 2006 and John Grove before) obscured by the way Q9 was bound. If you print out the Q9 foldout and instead fold it along what seems (without any real doubt) to be the correct fold, the sun and moon panels end up sitting next to each other, followed by a series of five otherwise inexplicable circular diagrams. But alchemy? The only candidate image I could point to is the pair of implausible giant berries at the end of Q13, which is very far from the kind of systematic comparison you're hoping to find. Well, on my screen the sun is on the left, and for all viewers, except for her: she sees the sun on her right, that is correct. Is that the way medievalists wrote and drew? From the perspective of the person in the drawing ???? Back to #1261‍ and the presented "Liber chronicarum, Nuremberg, 1493". 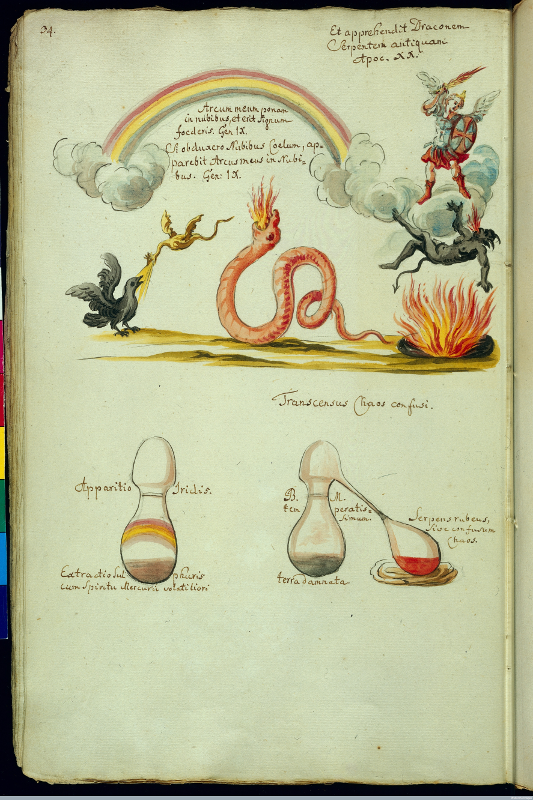 I could only find one recognizable link to the meaning of the rainbows in an alchemical manuscript. At least Noah / Noach as a central figure of the flood is mentioned. 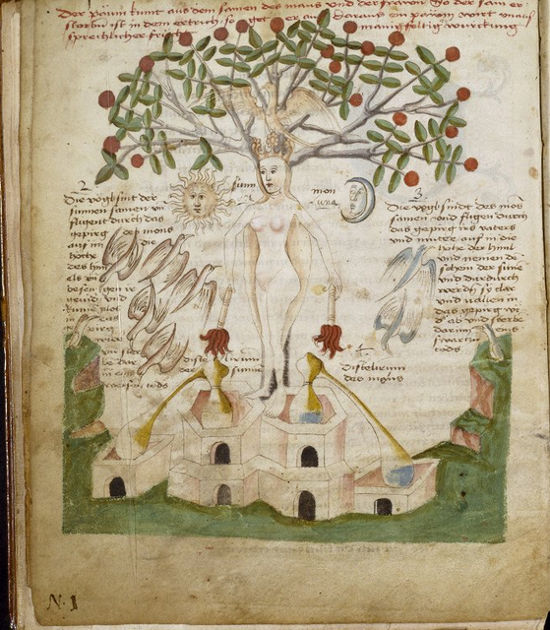 Wellcome Library, MS 4775, 1725 (? ), You are not allowed to view links. Register or Login to view. It is about the book of Genesis, chapter 9 (God's covenant with Noah / Noach). The "Apparitio Iridis" is shown with the "Extractio Sulfuris". Starting at the illustration on You are not allowed to view links. Register or Login to view. (bottom left), one can assume that alchemical processes are described in the so-called "balneological section". Of course, there is no usual symbolism in the VMS which points to sulfur, mercury and salt (? ), but green would surely be the color of choice. Does anyone know a comparable, older source as MS 4775 ? Quote: The "Apparitio Iridis" is shown with the "Extractio Sulfuris". Starting at the illustration on You are not allowed to view links. Register or Login to view. (bottom left), one can assume that alchemical processes are described in the so-called "balneological section". Of course, there is no usual symbolism in the VMS which points to sulfur, mercury and salt (? ), but green would surely be the color of choice. Some thought about this manuscript on the forum "Tarothistory", the topic You are not allowed to view links. Register or Login to view.